Elections ’08: Roadmap to the White House, now translated! With that in mind, SAALT strives to translate some of our most relevant materials into South Asian languges so that limited English proficient individuals can take advantage of our resources. One example is What You Need to Know to Become a US Citizen (translated into Bangla, Hindi and Gujarati). We are also pleased to announce the translation of one of our new Elections ’08 documents, Roadmap to the White House, into Bangla, Hindi, Punjabi, Tamil and Urdu). It’s a great resource to use by anyone to learn about the processes of the election cycle. Organizations and individuals are welcome to use it for outreach and education within the South Asian community. Please feel free to download these documents and distribute them. Check out these other resources by SAALT on issues facing limited English proficient South Asians! Language access comes up in A National Action Agenda, a policy platform recently developed by the National Coalition of South Asian Organizations, too, particularly in the areas of data collection, gender equity, health care and youth empowerment. Issues of language access play out at the local level as well. Be sure to read SAALT’s report about Linguistic and Cultural Barriers for South Asians in New Jersey. My name is Mou Khan, and I’m the Program Assistant at SAALT. Today is an exciting day for us here at SAALT. Not only are we unveiling three great new documents as part of our efforts around the upcoming elections (Elections ’08: A Roadmap; Elections ’08: How Do I Get Involved? and Policy Brief: Civil Rights and Immigrant Rights), but we are also rolling out our new website (bookmark www.saalt.org!) In addition to all of that, we are thrilled to welcome you to our new blog and we wanted to take this opportunity to go into some of the new aspects of our website. 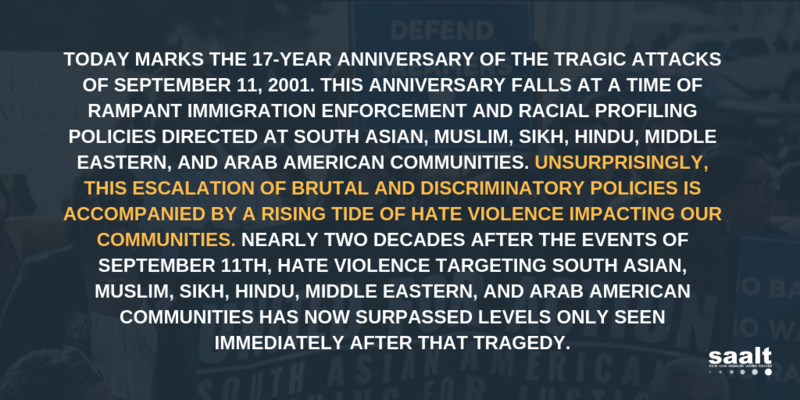 This blog: We will be updating it regularly to keep you updated on what’s happening in the world of civil and immigrant rights, social justice issues, and, of course, the South Asian community. Click here to get the RSS feed so you will know whenever there is a new post. Also, we want to hear from you! Please post comments and, if you like what we post, link to it on your own blog. Better yet, guest-blog for us! If you’re interested in guest blogging, email saalt@saalt.org. Elections ’08: How Do I Get Involved? lists 10 ways everyone (citizens and noncitizens) can get engaged during this election cycle and make a difference! New SAALT website: Our new website does not just have a new look (though we hope you are enjoying it! ), but it has all the great information and resources you are used to getting from SAALT, just in a new, easier-to-access format. Take a look around, and keep an eye out for new features, like our new Elections ’08 page. And check back in often, we are going to be posting up new resources and events regularly. Thanks for visiting and please come back often to see what’s new at the SAALT Spot!